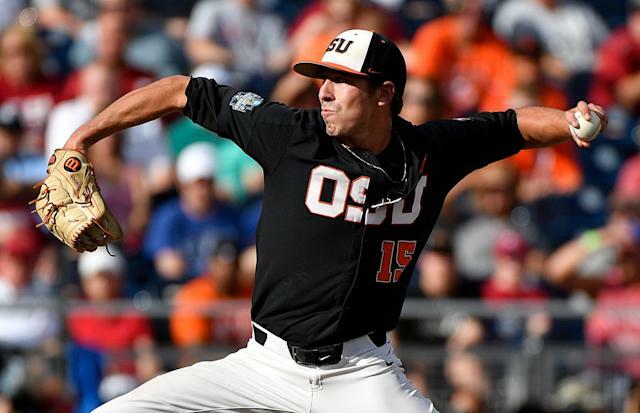 Former Oregon State pitcher Luke Heimlich agreed to a deal on Wednesday to join a team in the Liga Mexicana de Beisbol, according to ESPN’s Jeff Passan. Heimlich, who pleaded guilty to molesting a family member nearly a decade ago, has reportedly agreed to a deal with Tecolotes de los Dos Laredos, a Triple-A team based out of Nuevo Laredo, Tamaulipas. The 23-year-old pleaded guilty to molesting his 6-year-old niece when he was 15. Despite being one of the best pitchers at the collegiate level, no MLB team has been willing to draft the two-time Pac-12 Pitcher of the Year in either of the past two drafts. Heimlich’s conviction came to light after a 2017 story from The Oregonian. He has since insisted he is actually innocent, despite having signed a document that said, “I admit that I had sexual contact” with his niece, who told investigators that he “touched her on both the inside and outside of the spot she uses to go to the bathroom,” according to The Oregonian. Instead, Heimlich said he took poor legal advice to make the incident easier on his family. Several MLB teams, including the Kansas City Royals and Baltimore Orioles, considered picking him up as a free agent, but were worried about the potential backlash from doing so. Heimlich was signed by the Lamigo Monkeys of the Chinese Professional Baseball League last year, though the CPBL terminated the contract due to his criminal history. According to Passan, a pair of MLB scouts who saw Heimlich throw in January said that “the quality of his pitches had improved since college” and that he could pitch in an MLB rotation today. His new team will begin play on April 5. “We say his personal life and issues are things from past,” Tecolotes media director Juan Alanis told the Laredo Morning Times. “He is welcome like any other person that comes to give the best of himself and try to get a place (on the) roster. We all know about his situation, so sports management is focused on his performance with the Tecolotes for spring training.